Robert O'Brien - CEO MetaCompliance LTD.
Where do I get a playbook for my GDPR project? What level of training do I need to provide for my staff? Which article of the GDPR regulation should I prioritize? What policies do I need for GDPR compliance? These are questions we hear repeatedly during the "GDPR for Dummies" roadshow. Join us for this educational webinar, as we host co-author of the GDPR for Dummies Guide, Shane Fuller, who will be joined by cybersecurity thought leader, Robert O’Brien. Together they'll summarize practical approaches to implementing the GDPR requirements within your organization and provide key tips on making your job a little bit easier. They've found that no two GDPR projects are the same, but people are trying to overcome similar organizational challenges. This educational web conference will provide a practical, common sense approach to dealing with the GDPR, and how that translates into action within your organization. The busiest season of the year for many businesses is without a doubt, the festive period. For many organisations, the festive period means additional staff and with this influx of staff comes the increasing likelihood of human error that could lead to a cyber breach, particularly when all departments are under increased pressure. With this Webinar, we help organisations provision for the festive period by giving you 5 free ways to prepare for the onslaught of phishing and ransomware attacks. These tips will allow you and your organisation to be safe in the knowledge that the upmost is being done to protect your organisation from a cyber breach. There is so much material out there claiming to be the ultimate guide to your GDPR project, but a lot of this is complex jargon that doesn’t offer a pragmatic solution to the GDPR conundrum. Ensuring a successful GDPR project requires financial investment as well as time. With the May 2018 deadline getting closer, there is an increasing unease within organisations regarding their ability to mitigate the risk and demonstrate compliance. With this Webinar, we will provide you with 5 practical steps to implement your GDPR project. By the end of the Webinar you will be in possession of structured and practical solutions that lead to GDPR compliance. As a bonus for attending the Webinar, you will also receive a copy of the official GDPR for Dummies guide. We understand that GDPR is a complex issue, that’s why we worked with subject matter experts and the Wiley brand to create the official GDPR for Dummies guide that offers a practical approach to GDPR. Policies are critical to organizations to reliably achieve objectives while addressing risk and uncertainty and act with integrity. Policies set the boundaries and expectations for behavior of individuals, processes, transactions, and relationships of the organization. High performing organization rely on policies to provide consistent behavior and outcomes. This is particularly true in privacy, compliance, and information security management. However, policies fail if they are poorly written, not understood, or are just paper documents that are not followed in the organization. This webinar delivers guidance and best practice in engaging users on policies to ensure they are clearly understood and followed. It’s 2017 and the GDPR time bomb looms large. Is your organization’s GDPR compliance journey sitting stagnant while precious time ticks away? If so, get your skates on!! Amid the hype, what data protection practitioners need more than anything else is a real-world approach to the GDPR’s requirements, enabling them to devise and execute an implementation plan that will see their organization achieve GDPR compliance by the May 25, 2018 deadline. Join us for this educational web conference, and we’ll provide you with practical guidance covering the phases and activities that make up a GDPR implementation plan and offer suggestions for overcoming the major compliance hurdles that all organizations will face. The FBI reports that ransomware attacks have cost $209 Million in just the first three months of 2016, which is more than eight times the total for 2015. At this rate, ransomware is expected to yield close to $1 Billion by the end of the year unless individuals and organisations improve both their defences and security awareness. Organisations must determine methods of improving their employees’ ability to withstand these threats, or at least, counter the most obvious ones. Cyber Security Awareness continues to become a major issue for management attempting to steer a safe course in order to carry out their “business as usual”. •What are the best methods for countering the threat of phishing and ransomware? •How can we improve the resistance of our user population to this threat? 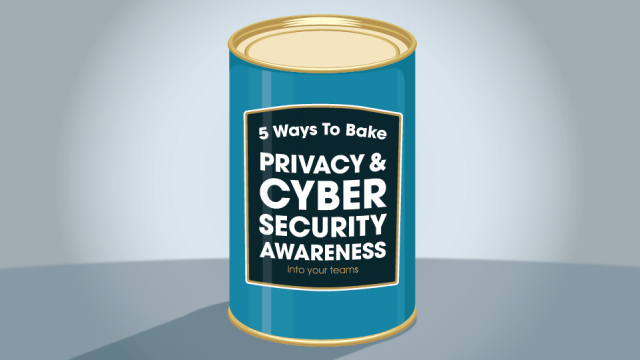 Where do you start with an IT Security Awareness Campaign? How can technology such as Policy Management and eLearning Systems assist in changing the IT Security culture within your organisation and what are the key measurements for determining success? Throughout this 20 minute webinar we will address the highly topical subject of increasing the resilience of your employees from an information governance perspective. We will discuss different methods that assist your staff to defend themselves against outside attacks such as phishing. We will also look to reinforce their responsibilities in relation to key security requirements including badging in and the protection of data while out of the office. There many ways to put together a staff awareness campaign, so allow us to share with you some of the experiences that we have acquired through assisting companies in this area. The best awareness campaigns educate, are engaging and were necessary enforce all staff to participate.